Cherry season is just starting here in the West, which means our family has been eating them with nearly every meal for the past week. It seems like in our area there is a magical time when cherries are only $2 or $2.50 a pound and we try to get our fill for the rest of the year since I rarely splurge on them when they cost more. We've had cherries on our oatmeal, cherries on french toast, cherries to snack on, and cherries at dinner. 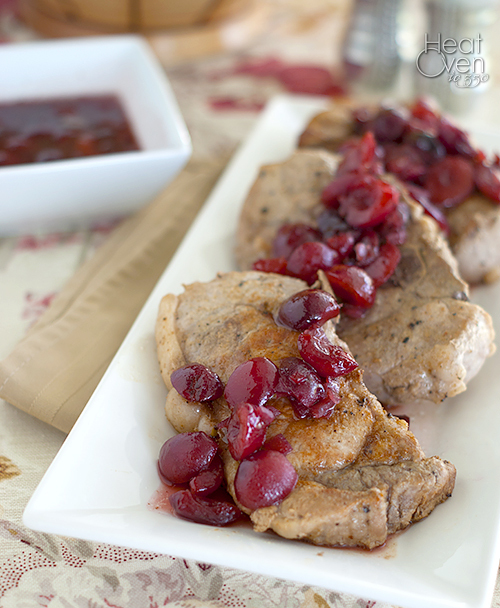 One of the new favorites recipes I've discovered in all our cherry gluttony is these delicious pork chops and cherry sauce. If there is one thing I love more than a stovetop meal that doesn't heat up my house, it's a stovetop meal with some kind of fruit sauce. I love the contrast of well-seasoned meat with a sweet-tangy sauce, and this one is especially good. The spice rub on the pork is wonderful. Plain and simple. Add in the subtle sweetness of the cherry-balsamic sauce and the meal is one of my favorites in a long time. The flavors are so rich and the presentation is so beautiful that it is hard to believe that it is so easy to throw together. That, in my book, is what we call a "keeper". For the cherry sauce: Heat the oil in a medium saucepan over medium heat until shimmering. Add the chopped onion and salt. Cook, stirring occasionally, until onions are softened, about 3 min. Add cherries, apple juice, vinegars and sugar. Bring to a simmer and cook until cherries soften, about 10 minutes. For the pork chops: While cherries are simmering, heat olive oil in a 12 inch skillet over medium heat. In a small bowl, combine kosher salt, coriander, mustard and black pepper. Sprinkle both sides of pork chops evenly with the spice mixture and rub it in with your hands. Place pork chops in pan and cook until browned, 4-5 minutes. Flip chops and cook an additional 4-5 minutes until both sides are browned and internal temperature is at least 145 degrees. Remove from oven and let rest five minutes before serving with cherry sauce. This looks delicious! Cherries are still super expensive around here so I haven't indulged yet this season :( I hope they go on sale soon, because they're one of my favorites! Nicole, this looks phenomenal! 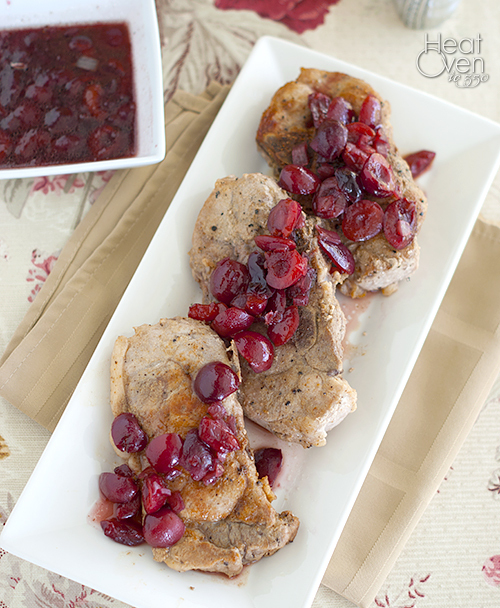 I love fruit sauces on my meat as well, and cherries are the perfect fruit for that. I need to try this out soon! I love pork or chicken and fruit, but hubs, not so much. I have to make sure it ends up more savory than sweet. He is so picky that way. This looks amazing! I eat it in a heartbeat! These chops look delicious, I really love the fresh sauce on top - looks like a perfect summer meal right now! I've been so disappointed by how expensive cherries have been around here this summer. I've hardly bought any because I'm just too cheap to pay $4/lb. Hopefully they go on sale soon because I really want to try this - I'm all about pork and fruit lately!